Flames burned bright the night of Friday, Oct. 19, in the East Campus Satellite parking lot during the Homecoming Bonfire, hosted by Student Activities. Both old and new Liberty fans gathered for a time to enjoy food, games and live music, getting pumped up and ready for the Flames to bring the heat during the weekend Homecoming football game against the Idaho State Bengals. “It’s a time for alumni and students to come together and get excited for the weekend,” Erin Diaz Cleveland, assistant director of Student Activities, said. “This is our first time having the event in a few years, but we hope to make it an annual event,” Diaz Cleveland said. Surrounding the massive, six-foot bonfire were smaller campfires where people could roast marshmallows or keep warm from the chilly autumn air. Food trucks with vendors from Nomad Coffee Company and Dawn and Dusk Donuts were also parked on the lot. Senior Jake Schwarting said once he heard about the bonfire, he had to come check it out for himself. Food was not the only exciting attraction. The Liberty drumline also came out with a booming performance to keep spirits high. Liberty’s mascot, Sparky, made sure not to miss out on all the fun, as he was seen interacting with the crowd, sporting a red flannel shirt just right for the occasion. While the fire blazed, rapper Humble Tip took to the stage, bringing energy with his music. He encouraged those in the audience to let loose and just have a good time. “I want to make sure we’re having a party out here,” Humble Tip said. 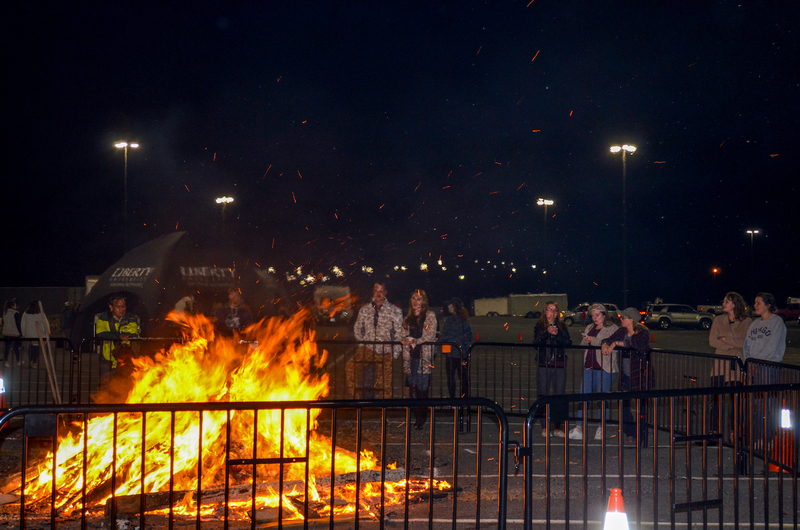 Toward the end of the night, Liberty alumni Isaac Seo described his experience at the bonfire. According to Diaz Cleveland, Student Activities is hoping to make a comeback with the bonfire and to keep it aflame in future years.